Cape Town - South Africa's Natalie du Toit has stormed to the gold medal in the women's 400m freestyle S9 final at the London Paralympic Games on Tuesday evening. Du Toit coasted to victory in a time of 4:30.18, 9.83 seconds ahead of Great Britain's Stephanie Millward in 4:40.01 - a new European record for the Brit. Australia's Ellie Cole bagged bronze in 4:42.87, while Emily Gray - the other South African taking part in the race - finished seventh in 4:59.77. 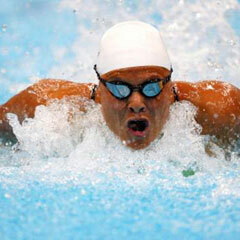 Du Toit owns the 400m freestyle world record of 4:23.81 which she set in winning gold at the Beijing Paralympics in 2008. With this win, she bagged her 12th career gold medal and her second at these Games after her 100m butterfly S9 win last Thursday. Shortly after Du Toit's heroics her compatriot Shireen Sapiro claimed bronze in the women's backstroke S10 final, finishing in a time of 1:09.02 to break her own African record. This pushed South Africa's medals tally up to 15 (three golds, five silvers and seven bronze).